This tender, juicy beef pot roast is flavored with optional red wine, beef broth, and a tangy tomato sauce and vinegar combination. 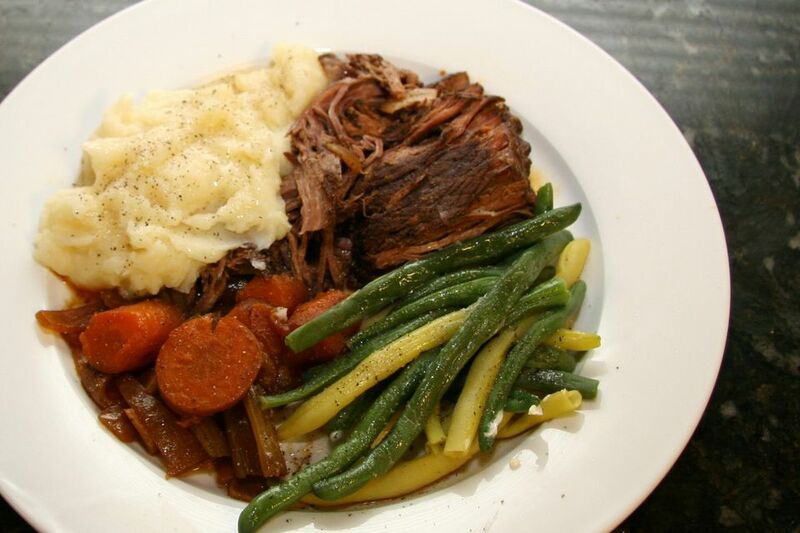 Use a boneless chuck roast in this slow cooker pot roast or another cut suited to long, slow cooking. Generously sprinkle the roast all over with salt and pepper. Rub the paprika into all sides. Sear the roast in the hot olive oil for about 5 minutes on each side to brown. Meanwhile, combine the broth, wine, tomato sauce, vinegar, and honey; set aside. Put the sliced onions, carrots, and garlic in the bottom of a 5 to 7-quart slow cooker. Remove the roast from the heat and place it on the vegetables in the slow cooker. Pour the broth and wine mixture into the hot skillet and use a spatula to scrape up any browned bits; pour over the roast in the slow cooker. Cover and cook on high for 1 hour. Reduce to low and cook for 7 to 9 hours longer, or leave on high and cook for 3 1/2 to 4 1/2 hours longer. Serve with hot mashed potatoes and green beans or corn for a delicious and satisfying family meal.